The Droid Razr, announced today and launching in November, is perhaps the thinnest smartphone to date, and among the lightest ever made. Motorola says the new Verizon phone is 0.28 inches thick, and that it weighs only 0.28 pounds. Despite its lack of girth, the Droid Razr combines beefy specs, fancy materials, and its slim design in an attempt to rule the holiday shopping season. The Android 2.3 phone will launch on Verizon Wireless in November for $299 with a two-year contract. The Droid Razr's internals hit all the bullet points you'd expect in a high-end smartphone. There's a 1.2 GHz dual-core processor, a 4.3-inch Super AMOLED qHD display (that's 960-pixel by 540-pixel resolution), an 8-megapixel rear-facing camera with 1080p video capture, an HD front-facing camera, and 32 GB of memory, split between internal storage and a microSD card. It's also a 4G LTE phone. On the outside, the Droid Razr sports laser-cut woven Kevlar fiber and a Gorilla Glass display, highlighted by aluminum accents and wrapped around a stainless steel core. A splash guard is designed to protect the phone from flying liquids. 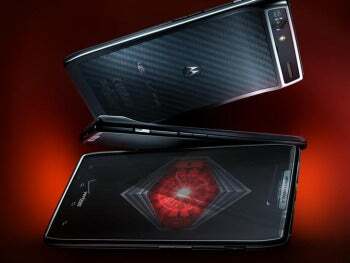 Motorola's stuffed a 1,780 mAh battery into the Droid Razr, and claims that will give a user 12.5 hours of 3G talk time or 8.9 hours of video playback. No word on how long the phone will run using 4G LTE, which tends to drain a phone battery in a hurry. To help conserve battery power, the Droid Razr can perform automated actions such as turning off Bluetooth and GPS at home, or reduce display brightness and processor speed when the battery gets low. This system, dubbed "Smart Actions," can supposedly boost battery life by 30 percent, according to Motorola. The Droid Razr runs Android 2.3 with what appears to be the same user interface as Motorola's Droid Bionic. That includes the ability to send and receive files from a linked PC--the Razr's version is called "Motocast," as opposed to the Droid Bionic's Zumocast app--and support for Motorola's Webtop application, which runs a full version of Firefox on Motorola's specialized laptop-like accessories that the company calls lapdocks. The first lapdock launched with the Motorola Atrix. When Can You Get One--Or Should You? Verizon will start taking pre-orders for the Droid Razr on October 27, but hasn't announced a firm release date. Tonight, Samsung and Google are expected to announce another high-end phone for Verizon, the Galaxy Nexus, which is expected to run the latest Android mobile operating system codenamed Ice Cream Sandwich. That means prospective Android phone buyers will have a tough choice to make in the weeks ahead. 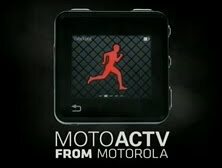 In addition to the Droid Razr, Motorola announced the MotoActv, a tiny MP3 player that looks a lot like an iPod Nano, but focuses on fitness, with a calorie counter and a Web portal for keeping track of fitness goals. It'll cost an eye-popping $249 for an 8GB model and $299 for a 16GB model, and goes on sale November 6.